Trucking & Slinger Services – Ace Bobcat Ltd. In order to provide fast and efficient service for our septic repairs, installs and excavations, it only makes sense that we have the trucks to move our own material as well. Many companies will sub contract the trucking part of their jobs. At Ace we do not want to have to wait or be responsible for others trucking. So, we have our own dump trucks to move sands, rock, soils, etc… Having our own trucking keeps your costs down and keeps our work on schedule. What is a “Slinger Truck”? Slinger trucks can carry a similar load to a dump truck, but rather than “dumping” the material, there is a large metal arm with a conveyor belt that allows us to literally “throw” or “sling” the material in the exact location that we want. This is an amazing machine that saves time and money as we can place material in hard to reach places and often we do not have to have another machine to come in and spread material as the slinger does it for us! 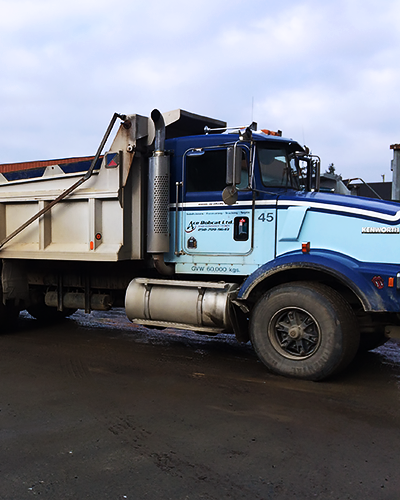 Our trucking and slinger services for Cowichan Valley and South Island include aggregates, rocks, sand, and other materials can be dumped or even spread. Aggregate deliveries, jobs site waste removal, and trucking services are available around-the-clock, contact Ace Bobcat today!